Who are the signers of this petition? When this document was being created, my prayer partners and I sought the Lord regarding who was to sign. Since that time, it is only at the direction of the Lord that I give or send anyone a copy of the petition to sign. I never ask anyone to sign it. I only ask that they read it and do whatever the Lord is leading them to do. So far, everyone He has led me to has been more than willing to sign it. Those who sign are responsible for standing in agreement with it and enforcing it by prayer. 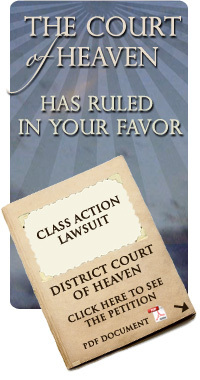 It states in the document that the plaintiffs are standing “…not only on their behalf, but also on behalf of all of their brethren” and “…will fairly and adequately protect the interests of absent class members.” Therefore, the signers have a great responsibility and must be extremely mindful of all resources that come into their hands, because much of those resources are for others. They must seek the Lord regarding what He wants done and obey. This is something we all should be doing, but the signers will be held accountable for doing it. I personally know the majority of the signers and I can attest to the fact that this is their normal lifestyle. They have a personal relationship with the Lord that was cultivated before this document came to fruition. What it boils down to is this: only the Lord knows who He wants and/or needs to sign this document. He is our Commander-in-Chief, the Commander of the host, and as His army, we gladly follow His every command. 2008 © Copyright. All Rights Reserved. CourtofHeaven.com.